This could be the most significant mile in my running history. I am well aware of this as I park my SUV in Peninsula High School's lot. I have already run three miles today wearing my trusty Asics Kayano 15s, but this will be different. There is no pressure to run fast. No need to go far. 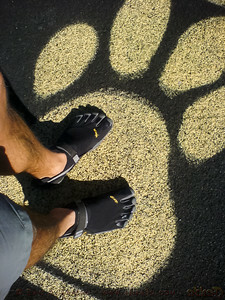 I am just here to try the Vibram Five Fingers TrekSport...to feel what they were designed to do. Part of the reason I have elected to run my first mile here is to reduce barriers to entry. PenHi's track features a rubberized surface. Though not as squishy as some, it should still be easier on my feet than asphalt. Additionally, the track provides the only flat surface near my home. While I do not expect the Five Fingers to cause issues on uphill runs (where I definitely favor toe-strikes), I cannot guarantee the same for downhill stretches (where I have a tendency to relax my stride). With my next marathon only two weeks away, I am not taking any chances. Upon opening the door, I immediately notice broken glass on the asphalt...perhaps my biggest concern about using these minimalist shoes upon the road. Fortunately, I have noticed this obstacle and can safely step around it. I keep my eyes open for more shards as I walk towards PenHi's track. I walk out on to the track as my Garmin watch locates the GPS satellites and finds my position. I hit the start button and accelerate to a comfortable pace. There's a natural spring to each step. I feel light on my feet. My feet do not notice the absence of cushioning or support I would get in my Kayanos, but immediately are aware of how much less clunky they feel. As I reach the first straightaway, I see my pace is in the mid 7's per mile range. I am not exerting any effort to run fast, so this is a very good sign...especially given how much slower I ran during my earlier 3 miler. My second lap feels even better. I sense my pace increasing and my stride seems stronger. Same is true of my third lap. As I glance again at my watch, I see my pace is now solidly in the mid 6's. I am approaching 18 miles over the past two days. I should be tiring, but instead find myself cruising. As I round the final turn of my last lap, I have plenty left for a speed boost. Kicking it into high gear, my pace drops into the mid 5's. If I wasn't running a race in a couple of weeks, I might have been tempted to keep going. I complete my mile in 6:49.71...not among my fastest, but faster than any I have run in over a week...and probably the easiest sub-7 minute mile I have ever run. Now I am really eager to attempt longer runs in these shoes. Of course, there's still a chance I will pay a price for this break in my regular training routine. Check back tomorrow morning to see how my legs and feet feel!